Lehenga is famous dress among the brides and other women and girls in India and Pakistan, it is selected in different styles and colours in different occasions. 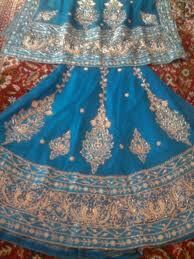 Lehenga has shot upper part and long lower part, and it is decorated with scarf known as chunni. Mostly it is wear on special occasions like Eid and wedding, it is decorated with stones, gota and golden threads. Lehenga and choli is usually made up by the silk which is attractive and with the passage of time, there are varieties of work which are implemented on lehenga like zari work, beads work, booti work, dori embroidery work, dumka work, gota patti, sitara work, stones work, mirror work and zardosi work. The given lehenga choli is blue and red in colour and decorated with different types of golden and white gota work. The lehenga and choli borders are embroidered with same patron and design, the chunni is also decorated withe same style and colour of threads.